The little engine that could--and still does. 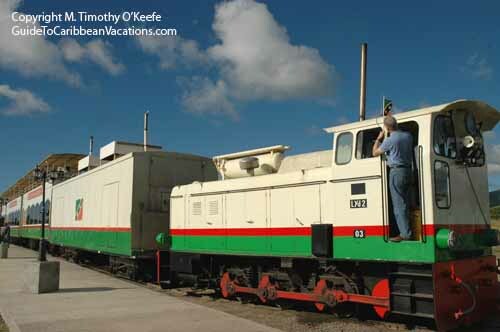 This small engine moves the Sugar Train's five passenger cars along narrow gauge tracks built between 1912 and 1926 to haul sugar cane from the fields to the sugar mill in the capital city of Basseterre. The tracks extend for about 30 miles. Sugar cane was the mainstay of St. Kitts' economy until the 1970s. Tourism has rapidly replaced it as the main source for foreign revenue. Rolling green sugar cane fields may dominate most of the island landscape, but agriculture accounts for only 3.5 percent of St. Kitts' gross domestic product.